We took a 67 ft luxury Princess from Kawthaung Harbour in the south of Myanmar to Phuket which is only a 150 miles journey. Kawthaung is the main port of Mergui Archipelago. It is situated just across the Pakchan River from Ranong, Thailand’s most northerly port on the Andaman Sea. The two ports are connected by longtails departing from the pier of Ranong. After spending 24 hours in Kawthaung it was time to depart. But departing is never straightforward in Myanmar due to the numerous paperwork formalities. It can substantially delay proceedings. The use of the local clearance agent is the must here, as you will not be let out of the country if your documents are not in place. This is when knowing the local requirements and anticipating the officials’ requests can be helpful. We finally departed Kawthaung in the afternoon and not in the morning as we planned. We could not make it to Phuket that day, so had to stay overnight at Ban Tap Lamu in the area of Khao Lak National Park. Next day we left early morning and with high tide and good weather conditions we cut to the north of Phuket. It took us underneath Sarasin Bridge linking the island with the mainland. This cut our journey time to our destination of Phuket Boat Lagoon by several hours. This shortcut should only be attempted in good weather conditions, at high tide and with good local knowledge. Burma is a desired cruising destination for many people. It is an amazing country with a stunning coastline and gorgeous islands. We are desperate to explore it and hope that the new government will create more favourable grounds for marine tourism by simplifying the bureaucracy and giving more freedom to the boaters when cruising. 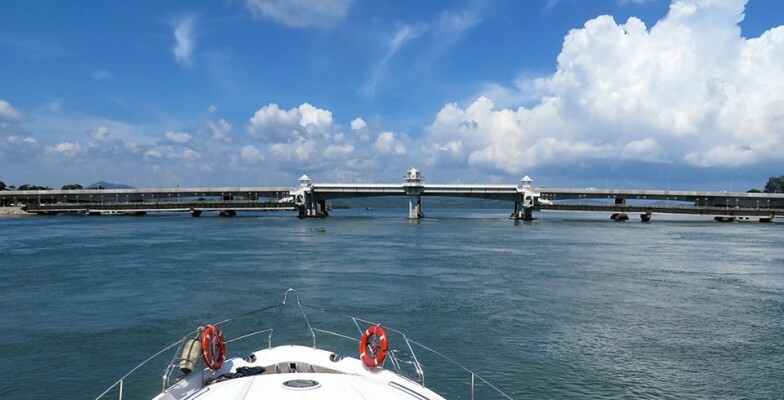 Picture: about to pass under Sarasin Bridge.